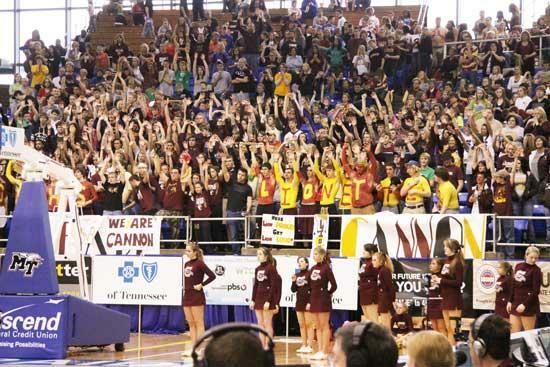 Members of the Cannon County cheering section, which represented more than two-thirds of the crowd in attendance, cheer the Lionettes to victory in the quarterfinals of the TSSAA Class AA State Championship. (TONY STINNETT photo). MURFREESBORO - Cannon County made the most of every second in its first trip to the TSSAA Class AA Girls State Tournament in 19 years. No. 8 Cannon County (30-7) broke a 51-51 tie on Chelsey Payne's driving layup and subsequent free throw with 41 seconds remaining, and Emily Sissom sank three free throws and collected a steal in the final 15 seconds to lead the Lionettes to a 57-51 win against No. 2 Elizabethton (34-2) in the Class AA quarterfinals at MTSU's Murphy Center Thursday afternoon. The win was the 200th of sixth-year Head Coach Michael Dodgen's career in his first state tournament appearance. Cannon County will face No. 1 McMinn Central (33-1) in semifinal action Friday at 2:30 p.m. The Lionettes dealt the Chargerettes their only loss during a Thanksgiving Classic in Woodbury last November. The two teams also met in last year's Sub-state round when McMinn Central ended Cannon County's season one game shy of the state tournament. "As the season goes teams do change, but I don't think much has really changed here," senior Taylor King said. "We still have that chip on our shoulder from last year when they ended our season. We remember how that felt. We just have to give it our all and in the end the better team will win." Sisters Emily and Abby Sissom led the Lionettes with 17 and 13 points, respectively, and combined to connect on all six of the team's 3-pointers with Emily knocking down four. Payne finished with 10 points and seven rebounds, Lauren Ruehlen narrowly missed a double double with a dominant seven-point, 10-rebound performance, and King finished with six points, eight rebounds and three blocked shots. Lindsey Reed also made her presence felt on the boards with nine caroms and her always solid defense. "Elizabethton is a really good basketball team. They reminded me a lot of Upperman," Emily Sissom said. "Every time we would make a run they just kept coming at us hard. We knew it would be a tough game and it was. There is a reason why that team won 34 games this year. It was a battle until the end." Dodgen said his team's effort and tenacity were key on a day when they did not shoot up to par. "I'm proud of the way our kids battled in this game," Dodgen said. "We turned it over and helped them get back in it a little, but we never let up and we kept battling and got the win. The effort was outstanding. We get one more and we will see what happens." Cannon County led 50-43 following Payne's layup with 2:38 remaining and the highly-partisan Lionette crowd was in a frenzy ... until Elizabethon showed its moxie and responded with a 8-1 run to tie the game, 51-51 with 59 seconds remaining. The Lady Cyclones, trailing 51-48, got a break when Payne turned the ball over in the open court with time running down. Cara Bowling, who scored a game-high 28 points, scored and drew the foul. Her free throw tied the game, 51-51, with 59 seconds remaining and marked the first time Elizabethton had been even or ahead of Cannon County since the 7:24 mark of the second quarter. Payne made up for it on the next possession when, out of a timeout, she took her defender around the right wing, drove her toward the basket, muscled in a layup and drew the foul. She converted the free throw to give the Lionettes a 54-51 lead with 41 seconds remaining. Bowling's 3-pointer with 16 seconds remaining was off the mark and Emily Sissom knocked down key free throws and, leading 55-51, secured a huge steal to effectively end the game. "In a close game one minute is a long time so when they tied the game I knew as long as we kept our head we could come together and do this," Emily Sissom said. "Coming out of the last timeout coach Dodgen told us not to shoot unless we had a layup because we had control there in a time game. Chelsey saw an opening and took her player in there. I think (Payne) kind of took that turnover and kept it on her shoulder. She wanted to make up for that and she did. She got it back for us." The first half featured nine lead changes as the players battled early jitters and adjusting to the spacious Murphy Center. The game was tied 14-14 at the end of the first quarter, but Ruehlen's short jumper gave Cannon County a 18-17 lead with 5:10 remaining and Abbey Sissom's long 3-pointer provided the Lionettes with a 21-17 advantage with 4:46 to play in the half. It was the largest lead for either team to that point. Abbey Sissom did not play like a freshman in her state tournament debut. The heralded rookie had 13 points, four rebounds, three assists, two steals and even blocked a shot. Most important was her tenacious defense on Elizabethton senior point guard Kristen Powell, who was limited to two points on 1-of-5 shooting and four turnovers. "(Powell) was really quick and I just had to try and body her up and play tough defense," Abbey Sissom said. "Our team defense was really good and we limited their second shots." Second-chance points were huge as Cannon County managed nine and held Elizabethton to two. The Lionettes won the battle of the boards 43-32 and had four players with seven or more rebounds, led by Ruehlen's 10. "It was a very physical game. They are one of the most physical teams we have played all year," Ruehlen said. "Our rebounding was a key in this game. It made a big difference." Ruehlen also made her presence felt offensively. Elizabethton had cut the lead to 37-35 with 7:28 remaining when Ruehlen put together back-to-back scores to push it back to six, 41-35, with 6:12 remaining. Emily Sissom's long-range treys, particularly in the first half, helped establish the early lead. Cannon County scored almost one-third (20) of its points in the paint and scored 16 points off of 12 Lady Cyclone turnovers. Way to go girls!!! =) Good Luck on Friday!! Good luck Friday, proud that I am a "Cannon"
Great all around game and fantastic fan support. Let's do it again tomorrow!!!!!! We are so proud of you! Keep up the good work! Good job girls you all played a great game. Way to go Lionettes! Way to keep pushing! You have brought this county together. Will these games be televised on DTC TV? Congratulations Girls! Way to Go! Congratulations on the win everyone at work will be talking about it. I assume tomorrow's game will be done the same way. Awesome game by all the players, but I thought Taylor King was a BEAST on DEFENSE! I don't know what her block total was, but she shut those girls down on the inside! To Swilliamson, i think it will be aired on PBS. But you can always check out tssaa.org and it will let you know what channel it is aired on. Way to go Lionettes on an AWESOME game. I am so proud to see all the fan support that this team has. It is just amazing. We R Cannon... and proud of it. Good job girls. I do have one question. Why are the schools getting out early to go to the game? I understand for the High school to get out, but the elementry schools? To goofyred- Three words--- WE ARE CANNON!!!! Sarah and redmolly, no I am not going to the game. I'm not yelling at any one here, so please do not yell at me (Large caption is yelling). 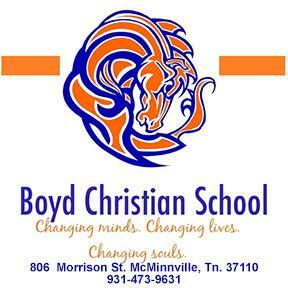 The schools can go to the web site to watch the game. I believe my childs education is more important then a game. This game has nothing to do with elementry schools. As i recall the schools saw the game yesterday on the web site so why can't they do that today? I may live in Cannon County, but that does not mean I have to go to the games and route for some one I do not know. Don't get me wrong I like Cannon County. Goofyred, it's called a community being united. I'm sorry that you can't comprehend how big this is not only for the girls playing and the coaches, but for everyone in the "community". I agree that your childs education is very important, but I feel that 2 abbreviated school days will not ruin their educational future. Always remember "WE ARE CANNON"
Please move out of this county goofyred. Goofyred, this is one of those times I can't even begin to understand your concern or complain. I apologize in advance so turn down your computer if you don't want to hear me yell .... WE R CANNON, WE R CANNON, WE R CANNON!!!! First, allow me to commend Director of Schools Barbara Parker and the Cannon County School Board for the decision to allow students to attend these girls state tournament games involving Cannon County. If you could not feel and sense the community pride that surrounded the Lionettes Thursday at Cannon County then you really missed out. Gooofyred, rather than complain about educational opportunities I would hope you would take this opportunity and use it as an educational experience. Consider it a field trip. I would think the opportunity to demonstrate the importance of community and becoming something bigger than yourself is as educational as taking children to a petting zoo, a pumpkin patch, a train station, an IMAX Theatre to watch a movie, etc. Your child does not have to attend the game but what a missed opportunity. These young ladies have brought this entire community together. It has just been amazing for this "outsider" to watch. It has been even more extraordinary to get to know these young ladies, their coaches and support staff. It is not Cannon County's fault the Class AA games are played during the day, but these girls do deserve this support. I'm proud of the thousands of people who have sacrificed time off work, gas, etc., to travel to many games. What a shame it would be if the same support was not there just 20 miles down the road. Cannon County has not been in the state tournament in 19 years. Soak it in. Enjoy it. These girls deserve it ... and so does this county. I may not be from Woodbury but because of not only the Lionettes, but also the Lions, I do feel like I AM CANNON!!! Go Lionettes and thank you for giving all of us a feeling of pride and belonging. I sincerely thank you for that and appreciate this county embracing these young people. They are our future. Goofyred, you don't have to attend the game but I sure hope the fact that some people may not know your child won't prevent them from supporting him/her if he/she should ever be in a similar situation. Again, thanks to all who have made it possible for this county to get behind our team. The support and the Lionettes have been the talk of the state tournament. Mr. Stinnett, Once again a professional and very well written response. As I have done in the past I just want to Thank You for taking Cannon County under your wing. I hope everyone in the county realizes what it takes for you to do the job that you do at the level that you do it in. Stinnett = awesome. And yesterday's game was epic. http://www.tssaanetwork.com/ is the website you can use to watch today's game. Saturday's games will be on the website AND on NPT (Channel 8 and 22). Jacktheguru, NO I WONT MOVE. If this is how the Cannon residents are going to reack to some one asking a question or even trying to understand why, then I am sorry for you. I may not be from Cannon, but I do have more respect then telling some one to move for just asking a question. I have been here in Cannon, TN for a short time. I came from the city and I am trying to adjust to the country setting. So far, I have met some really nice people here, but not on this Cannon Courier response side. I don't yell at any one here and all I get is yelling for a simple question. I will never judge a book by its cover again. I have now seen the other side of Cannon. Thank you. goofyred it is just a reaction from people trying to live vicariously through their children. Alot of these parents had big dreams of their own, and put all their efforts into sports only to realize that they really needed an education. Now, it is too late for them so they put pressure and push their kids to make up for their mistakes. So you see it is not your fault it is all that aggression built up inside them that make them so hateful towards anyone who ask why the schools were let our early.